National Bank of Pakistan has enhanced the Advance Salary Loan for Government, Semi Government Employees. 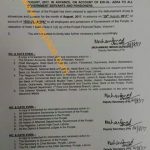 This enhanced facility is for the employees of BPS-17 and above, however the lower scale employees are already availing the facility of Advance Salary up to 490,000/-. Earlier this facility of Rs. 490,000/- was for all the employees, now this facility has been enhanced up to 1,000,000/- for the employees of BPS-17 and above. It is further added that NBP is granting advance salary loan to the employees at a very low rate as compared to other banks of Pakistan. Most of the lower grade employees have already availed this Advance Salary Loan facility. The duration of this loan is from 1 to 5 years. And the amount of Advance is equal to 20 x of Net Home Take Salary. 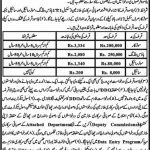 our dosry bath ye he.k ye advance salary loan bewa awrath le sakthi hey jo apne shohar ki pantion 45000 ropy ley rahi hey. 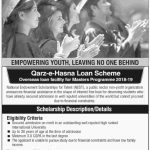 Dear Ijaz just contact the nearest branch of NBP for further details. MARI SALARY HEY 35000 OUR MEY ADVANCE SALARY LOAN LENA 1500000 ROPEY.ES PAR MARKUP KETNA HO GA.OUR MAHINEY KA QEST MY KETNA JAMA KARONGA.PLEASE GUIDE ME. Main army main hn main ny bank manager sy advance salary loan k leu poocha to us ny kaha k hm army waln ko loan nai dety meri pay b nbp main hi aati hy to asa kesy hosakta hy?? I'm Dr khan, I just wana know the saiban loan for flat purchase upon mortage scheme. With my salary MAASHALLAH 90000 rupees, flat cost 3500000, , demand 3000000, period for repayment 20 yrs. What will be the interest / mark up, monthly installments. Dear Adeel jilani, you can apply for the same. 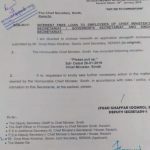 sir mara bhai ki salary 18000 per month h aur wo army mn as a soilder appoint h kia mara bhai loan la sakta h aur wo kitna loan la skta h aur monthly instalment kitni bani gi agr hm 3,50,000 amount lan please guide me. Dear Adeel jilani, you can use the Loan Calculation sheet for the same, that is available at this website.He can take 20 Salaries. may pak armay may civil employe hoon. Dear Waqas aap main branch sey rabta karain. Dear Waqas, if the interst rate is 19% then 166929 interest banay ga aour 7782/- monthly installment hogi. Dear Huma aap ko loan mil jai ga.
Dear Shakeel ur salary account must be in NBP branch that is giving Advance Salary Loan. U can multiply the net home salary with 20 to find the amount of loan to be taken. Dear HIRA, ICL i think is a clearing company. I hope it will send its report within few days. Dear Humera, jis branch say aap nain loan lena hay us branch kay through hi apply kia jata hay. Dear Neha u again contact the concerned bank branch. mai na loan k liya apply kar diya hai ais mai max kitna time lagta hai aur mera proceedure kaha tak phocha hai yeh mai kesa jaan sakta ho.........???????????? Dear Khurrum aap apni branch say contact karain. 15 say 1 mah tak lag jata hay. mujhe2 months ho chuke hai aur branch walo na last sat ko bola tha k apka loan approved ho chuka hai aur sensation hona mai 10 days laga ga .....??? kiya approved hona k bad 10 days lagta hai ya nahi....??????? Dear Khurrum case approve hanay kay baad taqreeban one week main payment ho jaati hay. payment hona k bad hume kesa pata chale ga k humera account mai pase agaya hai ya nahi ....???? kiya bank sa phone ayega ...? Dear Kiran aap bank ka number lain lain aour 1 ya 2 din baad contact kar lia karain. before 3 years i got Rs.250000/. the NBP Timergara deducting Rs.7000/- per month from may salary. i dont know how much amount is deducting in interest and how munch in loan and inspite of thee years the ratio of deducting is still 7000/ why not it decreases. Dear Sir, just use the calculator loaded at mine site in the heading of advances to calculate the amount of interest. Rs. 7000/- will never decrease untill the period is completed. I visited the bank they agree to give the 20 month's advance salary but they also take profit of that much amount from us. I thought that it must be free(not profit). Dear Tahir, this can be explained by the Bank only. can i get Rs 490000 enhanced scheme loan on my salary that is 16000 ? 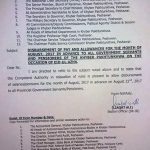 Dear sulman, it is only for Govt Employees. U can contact any branch of NBP for details. ager mai national bank of pakistan mai 10 lack invest karu to montly mujay kitna interest milay ga like her month mai kitnay rupee bank se nikalwa skta hu widout disturbing this 10 lack ! i want to take loan my payment 25000 per month i want to take loan 250000. i pay in 45 installment please tell me monthly installment and interest. Dear just use the loan calculator present at this site to calculate the amounts. my salary is 19400/= i want 20 salaries advance .kindly let me know abhout my installment montly and 1 thing my a/c is not in NBP .but i m a government employee so is it mandatory to open an account in NBP and tranfermy salary there ? Dear ur salary must be come in NBP for advance salary loan. for calculation the amount and interest plz use the calculator at mine site. To all Brothers.... Please it is not the point of contentment that the NBP has announced such amounting advance salaries. 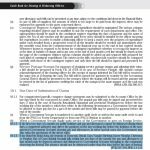 But the matter of fact is that it recovers fifty percent of the paid amount. If they want really to provide benefit to the bound handed Govt. employees , than NBP should relax the conditions and cut the interest rate too. otherwise it is universal show. What will be the interest rate if someone want to draw 5 lacs for three years? Dear just download the calculator from this site to calculate. Total Amount i have to pay : ? meri salary per month NPS NO 7 RS :13286 Rupees hy or mujhe kitna loan mly ga or hr month kitna insitallment katy ga kindly please mujhe bta dain i am waiting for your answar . Taqreeban 265000 Rupees Loan mil Jai ga. Agar Interest Rate 19 % ho to Loan Installment Rs. 6874 hogi aour total interest RS. 147454 Rupees Taqreeban Hoga. Aap kitni amount lena chahtay hain? give full detail with BPS. Yes he/she can. 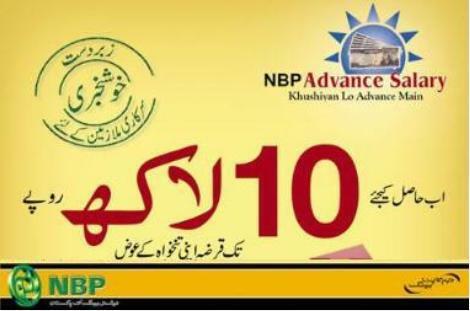 Just go to any branch of NBP that is giving Advance Salary Loan and get the Loan form. i want to ask that my net salary is 18000 its mean i can get 18000*20=360000 , my question is that how much money i have to return to NBP? and what will be an installment? yar 6 lacs pe 324000 intrest kese hogya, dekhye ek lakh pe intrest 18000 per year hoga na ? To 5 years ke liye 5*18000 =90000 hga na to 6 lakh pe 6*90000=540000 hga na yaa i am wrong plz guide ? it means that if u get 6 lakhs from NBP u have to return them 9 lakhs? Dear Rabia, just contact the nearest branch of NBP for the details. how much is markup rate in advance salary loan of NBP ? what is the monthly instalment if some onw withdraw 5 lakhs from NBP?